1. First of all, recognize that high-potential employees are a threat to your own job and treat them that way. These eager beavers are always exceeding expectations, are ambitious, and want nothing more than to step all over you to climb their career ladder. 2. Put them in a job rotation program, with a never-ending series of short assignments with no real accountability or opportunity to contribute. These people have short attention spans anyway, and will love the variety. 3. Because HIPOs are so good, you can ignore them. They are like self-licking ice cream cones. This will free you up to spend more time on your under-performers, and your email. 4. Give them impossible and unrealistic goals. We call these “stretch” assignments, or “development challenges”. And lot’s of them too. They’ll need to learn how to prioritize and learn from their failures. 5. Although you can call these “developmental”, treat them like assessments, a never-ending gauntlet of impossible chores. Then step back and watch them stumble and fall. 6. Tell everyone around them that they are a HIPO. Give them little “HIPO” name badges. Their peers will love them, and welcome them with open arms! 7. Make sure they change bosses frequently. You don’t want them to have time to develop a relationship with any one manager, constant change and variety is much better. 8. Take credit for their accomplishments. That’s one of the few benefits of managing HIPOs, they do produce fantastic results, however, it’s important to keep them humble. 9. Ask them to help out your under performing employees. This will teach them how to mentor and coach – they’ll love it! 10. Whatever you do, do not provide them with positive feedback. That would just swell their inflated egos even more. There you go! Follow these steps, and you’ll be sure to end up with nothing but a team of under performing, lazy, C player slackers. Then you can blame it on HR. I like #8. There are no original ideas, anyway. It's all about the team! If you had one or more people, whom you admired a great deal, offer themselves and their resources to help you reach your professional goals in the next few years, how do you think it would accelerate your progress? Leaders (especially those who believe they have undiscovered high potential) should take charge of their own learning and development. Leaders should be aware of their specific talents and whether they’re being fully utilized and developed. If companies are underutilizing them, they should actively seek environments where their talents can be used, recognized, encouraged and developed. Identifying your potential requires introspection and brutal honesty. Functional expertise becomes less important than other leadership capabilities as you rise higher in a company. 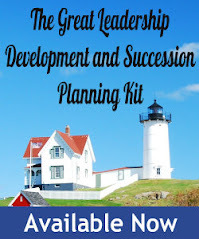 This work is best done with an experienced executive coach who can help you find the optimal developmental opportunities and mentors within your organization.